Transform your lab with a GeneTitan™ instrument and experience the superior power of streamlining array processing for discovery, exploration, and screening. 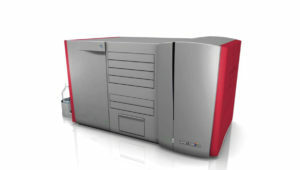 Both the GeneTitan Instrument for expression applications and the GeneTitan™ Multi-Channel (MC) Instrument for expression and genotyping seamlessly integrate hybridization, washing, and imaging in a single instrument to provide automated array processing—whether you are performing basic or applied research. Scalable — meets both medium- and high-throughput needs, enables fast time to data with fewer resources. Efficient — condenses hands-on processing time to as little as 30 minutes, images an array in less than five minutes, and operates unattended overnight. Flexible — supports gene expression and genotyping studies on multi-format array plates. Accurate — designed to deliver high-quality, consistent data by processing multiple samples under identical conditions. The GeneTitan System is automated from prepared target to data generation, which means higher data reproducibility, more confidence in your results, and up to 10 times the productivity of other platforms. Whether you’re performing basic applied research, or RNA or DNA applications, the GeneTitan System provides automatic answers for every step of the microarray workflow regardless of throughput. List of Applications compatible with the instrument.